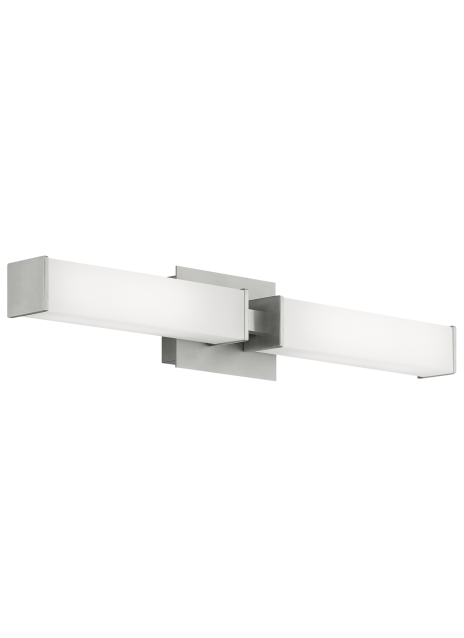 The Alden bath light by Tech Lighting marries modern design with everyday functionality. The Alden features two linear acrylic shades that convene with two handsome metal end-caps. Due to its glare-free acrylic shades the Alden provides an ample amount of task and ambient lighting into the surrounding space. This sophisticated bath light comes in three on-trend finishes, antique bronze, chrome, and satin nickel. The Alden scales at 6.4” in length and 4.8” in width making it ideal for bathroom lighting, bedroom lighting and foyer lighting. Your choice your choice of fully dimmable LED or Halogen lamping ships with the Alden bath light saving you both time and money. Includes two GX24Q-2 base 18 watt triple tube compact fluorescent lamps (electronic ballast included) or 20 watt, 1200 net lumen, 3000K LED modules. LED version dimmable with low-voltage electronic dimmer. May be mounted horizontally or vertically. ADA compliant.